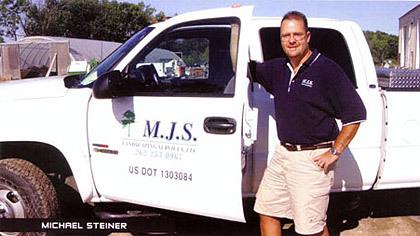 MJS Landscaping Services, LLC was founded in 1997 by Michael Steiner. At that time, MJS Landscaping Services consisted of just two small maintenance crews. A year later, the first construction installation crew was added. Fast forward to today where MJS is now represented by a full service design/build department along with a complete seasonal landscape management department. We have 4 landscape construction and 5 management crews, 2 management detail crews, and 1 residential management crew. MJS employs over 55 professionals with years of landscape experience. MJS Landscaping Services is located in Waukesha, Wisconsin, and we proudly service a large portion of Southeast Wisconsin. Our client base consists of residential renovation projects and new home construction with an emphasis on outdoor living, residential and commercial landscape management, and residential and commercial development relationships. We design and manage individual projects ranging from $3,000 to over $500,000. With a management team of 100+ years combined experience, our clients know they are doing business with seasoned professionals. Our quality, growth, and awards demonstrate our commitment to our clients and our industry, and we are constantly striving to exceed our customer’s expectations and push the creative envelope.